This trek was supposed to be long and challenging and so far it really was. For the past sixteen days we crossed from one valley to another, went through high mountain passes and stood at the foot of the highest mountain of all - Mount Everest. At the end we also climbed Island Peak (6189 m / 20305 ft) to get a taste of the true Himalayan mountaineering. Now only the final part was left: complete the Everest circuit and descend back to Namche and then further down back to Lukla and Kathmandu. After Thame Valley, Gokyo, Everest Base Camp and Kala Patthar only one big goal remained in our trek and that was the 6,189 m / 20,305 ft-high Island Peak or as it is locally known - Imja Tse. We spent a night in the relative comfort and low altitude of Dingboche and on the next day headed up the Imja Valley - the fourth major valley in the Everest area and the last we hadn't seen so far. Time now to see Everest from up close! 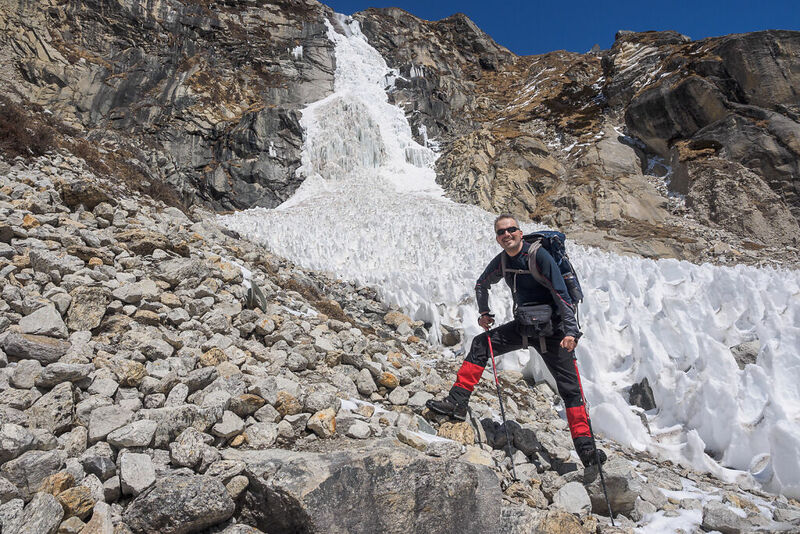 After an easy trek from Dzongla to Lobuche we had some busy time ahead of us: walk to Gorakshep, see the Everest Base Camp (EBC) on the same afternoon, sleep at Gorakshep; on the next day climb Kala Patthar early in the morning and in the afternoon descend all the way down to Dingboche. A bit of a marathon but after 10 days in the mountains and two high-passes of 5400 m I felt pretty well acclimatized and eager for some interesting new sights. With two major valleys in the Everest region (Thame and Gokyo) behind us it was time to see the most popular one - Khumbu. 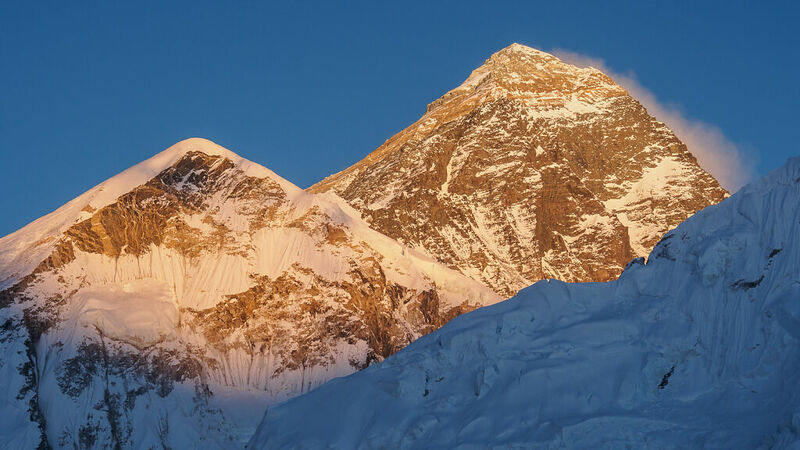 Its name comes from the famous Khumbu glacier that flows from the Western Cwm (cirque) of Mount Everest. 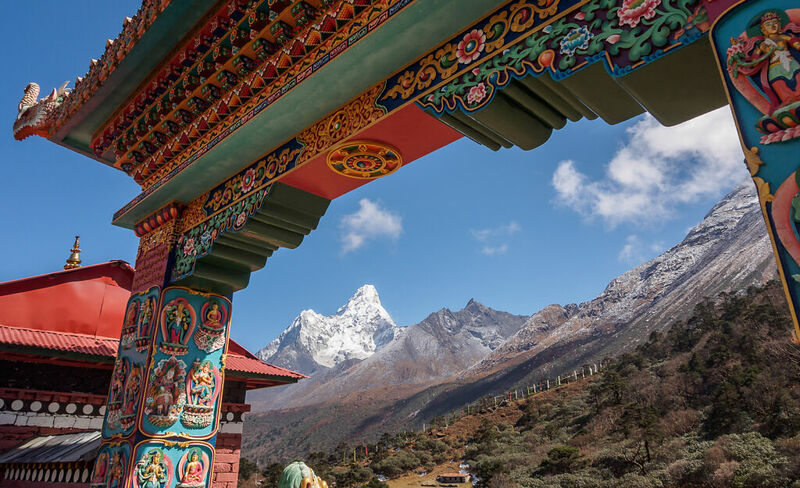 Khumbu is the most developed valley in the Everest region too, with villages and lodges lined along the trail to serve the thousands of tourists visiting each year. The crowds on that trail turned me off initially and made me choose a longer circuit trek instead of going straight to the Everest Base Camp (EBC) but its main attraction - being able to see the highest mountain in the world from up close - was still there so I was looking forward to it. But before that we had to cross through another high mountain pass: the famous Cho La. Gokyo in the morning. Mt. Pharilapche (6017 m) is to the left. Renjo La (pass) is up on the ridge to the right. Gokyo is a village located on the eastern shores of Dudh Pokhari lake (4700 m / 15420 ft), also known as Gokyo Lake. 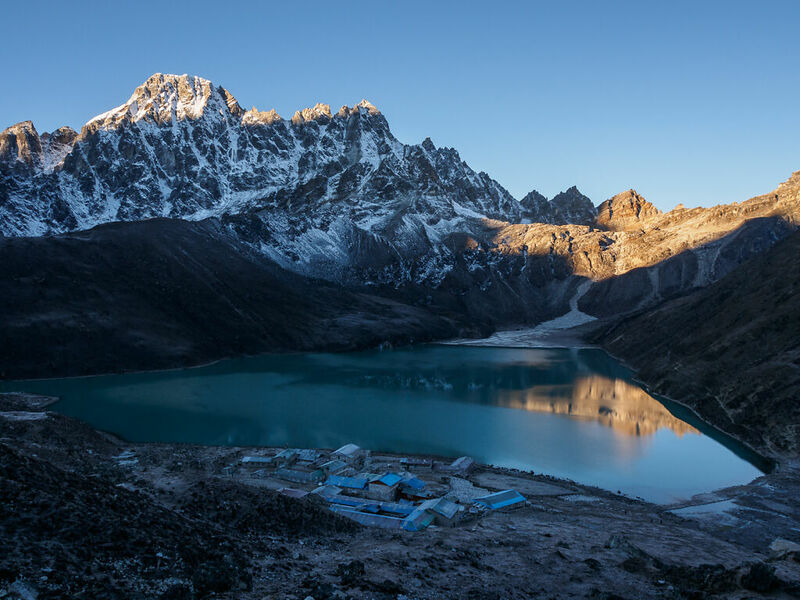 The six Gokyo lakes are lined along the Ngozumpa glacier in the upper part of the Gokyo Valley. Dudh Pokhari is the third lake - in the middle of the line. 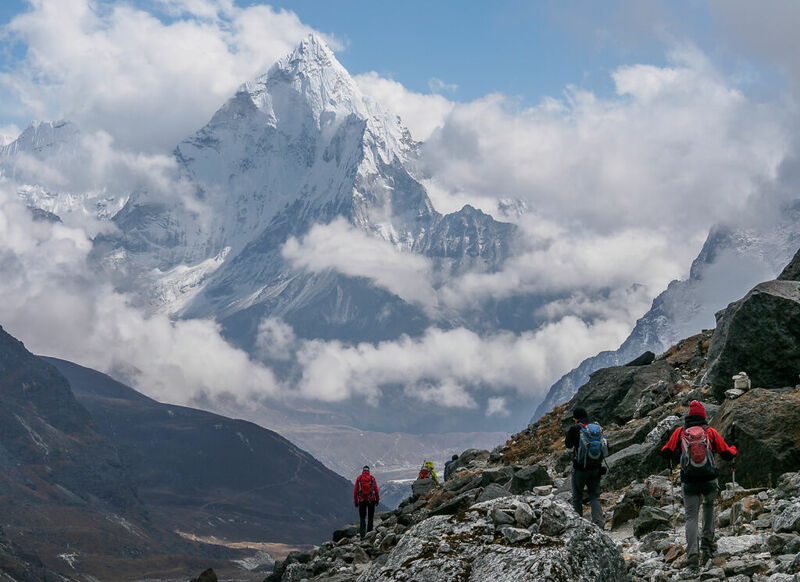 This has to be the second most visited destination in the Everest region after the Base Camp itself as it offers superb alpine views and scenic trails in all directions. 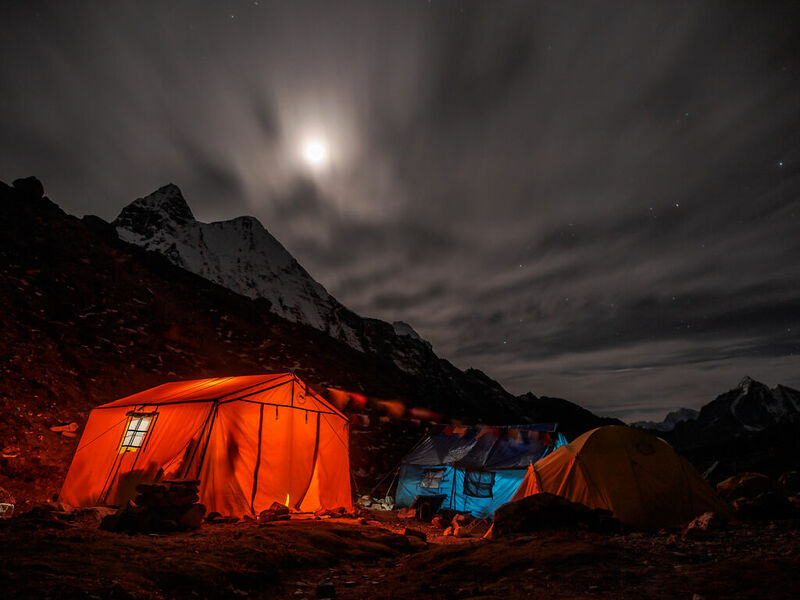 Most trekkers stay at least two days in the village to rest and to get some of the beauty of the place. Our group had two nights there too. The crowds usually heads for the nearby Gokyo Ri (5357 m, 17575 ft) on the second morning but but we had come from Renjo La on the previous day which offers a similar view so I had something else in mind for a half-day side trip. After 3 days in Kathmandu we set out for the mountains. Our group was small - just seven people from all over the world. Together with our guide we boarded what appeared to be the first flight for the day to Lukla (2860 m / 9383 ft) - the starting point for most treks around the Everest area. The flight is very short but scenic - especially early in the morning. The most interesting part of course is the final approach and the landing. The valley is relatively narrow and the planes have little room to maneuver. We met our two sherpas and four porters at the airport and after a short break we were on the trail. The main junction on the Everest trail is Namche Bazaar (3440 m / 11286 ft) and the distance to it is usually covered in two days. Our first walk was short and easy, the trail is wide and flat with heavy porter and dzopkyo traffic in its lower parts. Dzopkyos are a cross breed between yak and domestic cow which is better suited for lower altitudes than yaks who prefer colder climate. The trail goes through many Sherpa villages and at this altitude is very green. I spent 26 days in Nepal during the post-monsoon season of 2012. I had never been there before and I certainly don't go there every day so I thought I should get the best of this first trip. After many months of research and planning I set on an ambitious goal: to do one of the longest treks in the Everest area and also climb Island Peak (6189m / 20,285 ft). Due to flight delays, lost luggage and other unexpected events it is always a good idea to spend a few days before and after the trek in Kathmandu. We had three days on the way there and two days on the way back - good enough to see the main attractions in the Valley: Durbar Square, Bodhnath, Pashupatinath, Swayambhunath, Bhaktapur and Patan. Below are some of my favourite pictures from Kathmandu and its surroundings. More can be found in the Kathmandu Valley album. Here we go... I am starting this site as a place to share pictures and stories from interesting places I have visited. It is all about photography, travel and ... travel photography. I'll also try to keep it informative so visitors interested in travel can take away some tips and ideas about their future trips. 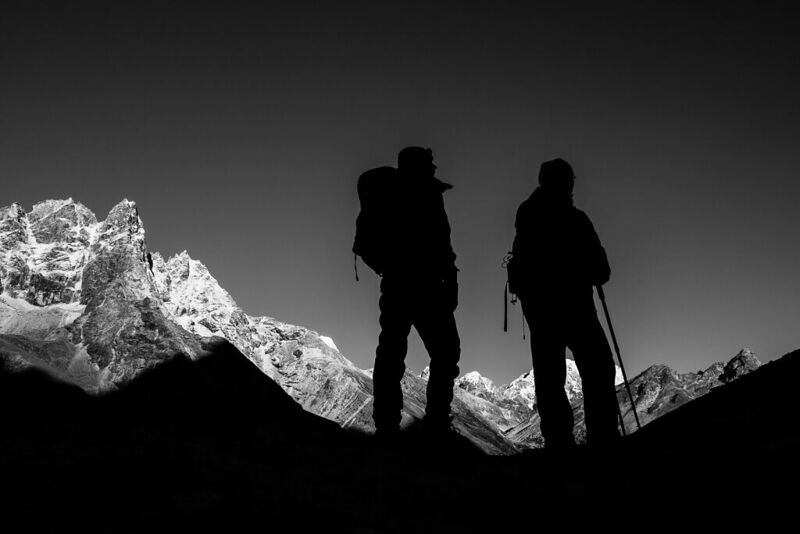 The first set of pictures I already started publishing is from my trekking in Nepal in October 2012. It was a long journey of 26 days and I came back with so many pictures that a whole month wasn't enough to go through all of them and decide which were worthy of showing here. Now that the site is up I hope to be able to post them more frequently.